Well, my onion order finally arrived last week and while I’m getting a late start on planting my onions, I’m sure I’ll have a good crop. I ordered three different long day varieties, red zeppelin, yellow sweet Spanish and copra. I chose long day onions because Howard County Maryland is on the border line between the intermediate and long day growing areas. Long day onions start bulbing when day lengths reach 14-16 hours. Knowing the approximate date of there arrival, I had prepare my raised bed with 10-10-10, adding about .2 pounds on nitrogen per 100 square feet of bed. Since my beds are approximately four feet wide and my onion and leek patch is about 30 feet long (120 square feet), I worked about two and a quarter pounds of fertilizer into the bed (.2 divided by .10 times 120 sq. ft. divided by 100 sq. ft.) The supplier of my onion plants recommended using a fertilizer with a higher phosphorus number then nitrogen and potassium (eg. 5-10-5 or 10-20-10), but I chose 10-10-10 because my soil test shows that I have very high levels of phosphorus in my soil. I started planting the onions as soon as they arrived. 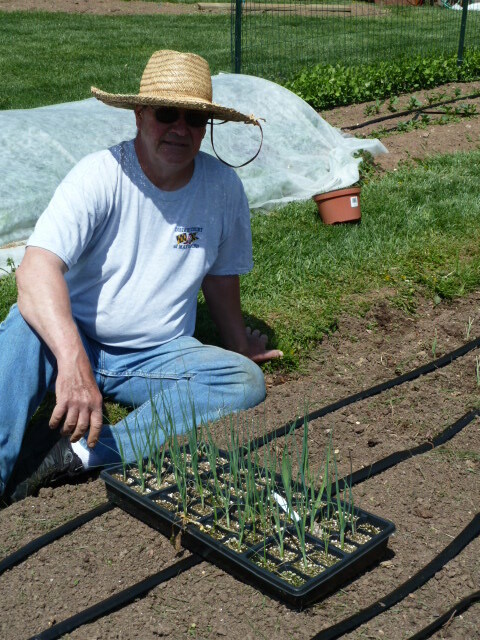 Since my raised beds are very high in organic material and drip irrigated, I planted my onions in a grid pattern with onion plants being space about six inches apart or six plants across my four foot wide raised bed. I also planted my leeks in the same pattern. This year, I’m growing a leek called Tadorna. I’ve had great success with this leek and plant a sufficient number so that I can winter them over and harvest one whenever a recipe calls for a leek. The seedlings shown in the picture were started February 4, so they have been growing for about 12 weeks, both under lights in my basement and in my cold frame. My onion supplier notes that onions like lots of nitrogen (they are heavy feeders) and recommends fertilizing the onions every two to three weeks with a nitrogen only fertilizer (eg. ammonium sulfate 21-0-0 in alkaline soils like mine or calcium nitrate in acidic soils). Their recommendation is to fertilize with a half a cup of fertilizer for every 10 feet of onion row. This agrees with the plant profiles for onions found on the University of Maryland’s Grow It Eat It website. 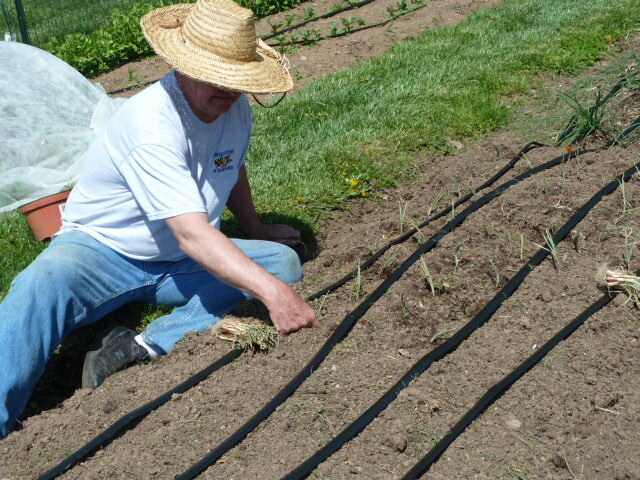 So, with my onions and leeks planted, all I need to do is water, weed and wait. I’ll update this blog as my onions start to grow.